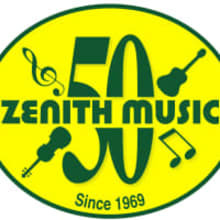 Established in Claremont in March 1969, Zenith Music offers the finest in musical instruments, the largest selection of printed sheet music in Australia, and CDs. Zenith Music is often called “The Best Music Shop in Australia” and is still a family business, owned and run by the Cranfield family. The people at Zenith Music are musicians who understand the needs and requirements when you are seeking your first, more advanced, or your dream instrument. Being a longterm Western Australian owned family business, Zenith Music is committed to music and music education meaning you can trust Zenith.